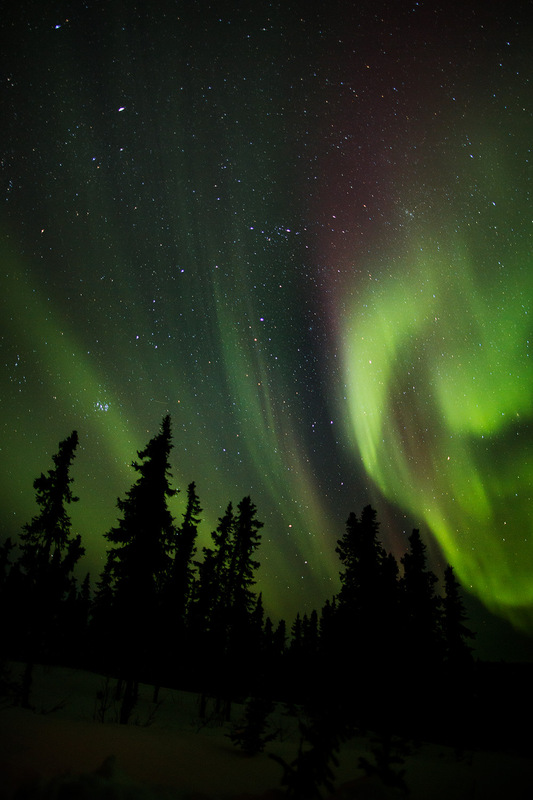 There are very few natural phenomenon that rival the awe-inspiring beauty of the aurora. 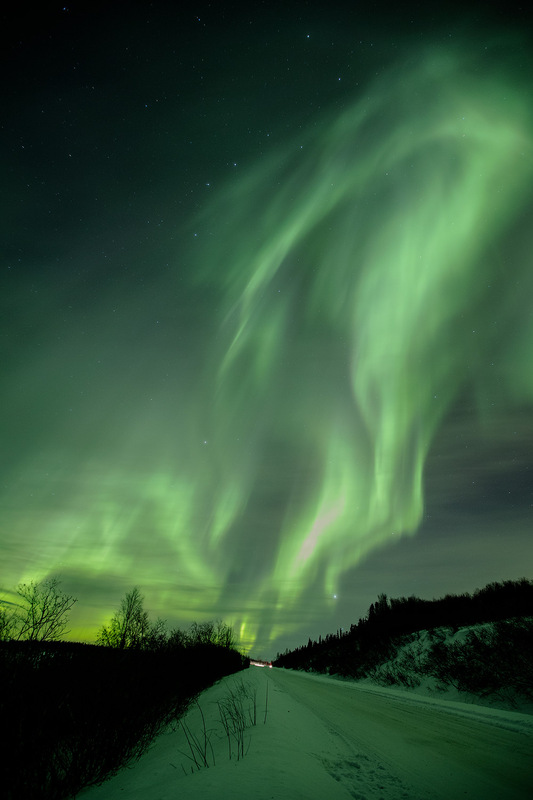 Join us on this Discovery series workshop to northern Alaska to photograph this amazing display of nature's power that has fascinated humankind for millennia. A research rocket streaks into the aurora from the Poker Flat Research Range north of Fairbanks, Alaska. If we are lucky, we may be able to witness similar launches during this aurora photography workshop. Clear skies allow for unobstructed view of the heavens as the aurora dances above a stand of White Spruce near Cleary Summit. Click to view full image. From our base in Fairbanks we will venture out into the Arctic night in search of the fascinatingly beautiful aurora borealis. We will plan to be in the field well in advance of "magnetic midnight", the time when the magnetic north pole is directly between us and our Sun which is usually the time of greatest auroral activity. Using data from space based solar observatories we are able to estimate the auroral activity and plan our photographic excursions accordingly. We will use every means at our disposal to get you under the Northern Lights! The main goal of this workshop is, of course, photographing the northern lights, In the event either the weather or the aurora isn't cooperating, we will spend the time searching out other wonderful subjects. The area around Fairbanks is rich with winter landscape, scenic and nature photography opportunities. All of the locations for this workshop can be reached with a minimum of walking. Most will be directly adjacent to a vehicle or other forms of shelter. Night time temperatures can drop to -40F or lower. The Big Dipper is visible behind this very bright auroral display above Steese Highway. Different gases in the upper atmosphere react with different colors to the solar wind. Interaction with oxygen usually produces greens and yellows, while nitrogen produces reds, violet, and ocassionally blue. 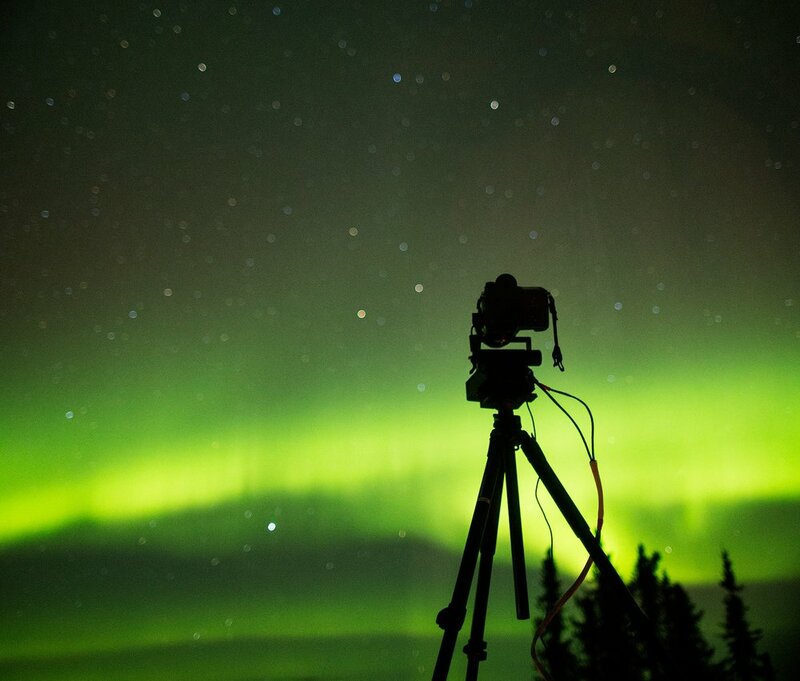 During this workshop you will learn about long exposure photography as it pertains to the aurora. We will discuss camera support, ISO requirements, focusing aids, equipment requirements, and "tricks of the trade". We will have a session on post-processing your images, with an emphasis on techniques for bringing out detail in your aurora photographs. Since pre-planning is very important to a successful shoot, you will learn how to take advantage of smartphone apps and web based assets to help inform your aurora photography decision making. You will learn about proper care, treatment, and safe storage of your camera gear that is essential in protecting it from the elements. Field Photography Sessions, All Park and Preserve Admission Fees, Class Session on Digital Image Processing, Critiques, and Image Print Session sponsored by Canon. We will have drinks and water while in the field, and a boxed meal will be provided on the days noted in the schedule. After registration you will receive information on the workshop hotel and booking codes. We strive to pick quality, comfortable lodging that fits with the logistics of the workshop. Most of time the hotels will be 3 star or better. Feb. 26 - Afternoon arrivals in Fairbanks, Alaska. Early evening meet & greet followed by orientation and dinner. There will be a field session this night IF the aurora is visible. Feb. 27 - March 3 - Aurora photography field sessions, post-processing sessions, critiques. Clothing suitable for arctic climate. Several zip-lock style plastic bags large enough to hold your camera body and lenses. It is possible to rent camera equipment in Fairbanks. There is also a fairly well stocked camera store in the area. You will receive more information on equipment after registration.